When you have your idea, your niche, your intended target audience, you've done your homework regarding market analysis - basically, you have it all set - then it's time to develop. Believe me, the clearest and most straightforward idea is not that straightforward after two hours of serious development work. One golden guideline is to keep it as simple as possible. If you are tempted to throw in scantily clad women hopping about in the background, since you really like scantily clad women, take a good long thought on if this really adds something to the format as a whole. It is very easy to make a complex format - just add a lot of rules along the way to "iron out the wrinkles". "If you go to level 2, you can then have the opportunity to double up, unless your opponent has the STOP card, because then he can make the turn of play go over to him, unless..."
This takes half an hour to explain, and even then it's not clear. Lots of work in the edit at the very least, cutting out all the "what could I do now again?" moments. Always get a second (and a third and a fourth) opinion. Someone might see something that you don't. And always do office pilots. Test your ideas - how do people play your game? How do they think in a given situation? Does your idea work or do they get hung up on details you never thought could pose a problem? Always be prepared to rethink, if a better twist comes up. Continuing the short series of advice regarding the development and marketing of tv formats. You have a brilliant idea for a new show. You can see the story line, you can see how the excitement builds, you know where the climax is going to come and you firmly believe that the pay-off will be good enough to keep the viewers coming back. There's only one thing that's not really right. You see yourself as a serious documentary maker, and this brilliant idea is a game show - a lot like Weakest Link only feel good and with a really funny and engaging twist. It's even interactive, in a logical and fun way! The development work goes a bit slowly, because you'd rather be doing documentaries. The sales pitches aren't really up to scratch, because you'd rather be selling - yeah, documentaries. In the end, you come back home from MIPCOM, a pile of business cards in your bag but no deals, no signatures and nothing better than an "interesting idea, do get back to us when it's been broadcast for a season somewhere!" as feedback. To create a great format you have to love it. It's perfectly alright to hate it at times as well, but the bottom line is - you have to love it. When pitching your idea to someone, nothing shines through as much as a non-really-interested pitcher. The pitchee will immediately sense this and think "well, if the MAKER of this format isn't interested in it, why should I be? Next!". Love it. Hate it, scream at it, throw it in the bin from time to time. But ultimately, you have to love it. Or else, let it go. At any given gathering for the television industry, a buyer will be pitched a multitude of game and quiz show ideas. "Think Deal or No Deal meets Fear Factor!" or perhaps "Well, it's Millionaire meets Wife Swap" or whatever. Very, VERY few of these will be original and exciting. My suggestion then, is to go for originality. Find a niche where there is a bit more space. It could be educational or edutainment formats - like this one - or it could be cross media shows. It could be something with interactivity or perhaps a really really novel take on current affairs? And I probably shouldn't have to say this, but do a thorough market research of the niche you choose. What's out there, who's producing it, what kind of ratings do they have and whom should you pitch to? The recent economic crisis in the US and worldwide wasn't that hard to predict. Everything that goes up must come down, at some point, which is just what is happening now. Furthermore, looking at the technical evolution, we had the hype around interactive television some years back, which quickly changed to a hype around UCG (User Generated Content) which next year was the enormous hype around mobile television... none of which has really really taken off as of yet, at least not to the degrees that was predicted at the outset. What can we learn from this? Well, a good place to start is to look at what formats channels are broadcasting and buying at the moment. Think one, or several, steps ahead from the current situation - what could be the next trend coming around the corner? Right now all sorts of feel-good shows are doing the rounds. Perhaps it's more green television shows? Some have already been made, but there's room for more, if they're done well enough. 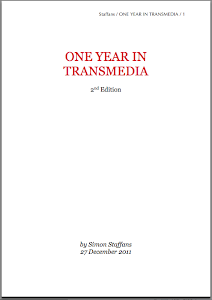 Or perhaps more elaborate cross media formats, integrating the Internet, television and mobile in new and exciting ways? I have my ideas, but since you're not paying my wages, I won't reveal them here :) But the conclusions are there to be drawn - go to c21:s pages to look for the latest news from the television industry, to informitv to read up on the interactive and cross media field, and why not the different ratings institutes (like Nielsen) around the world to look at what's selling right now. With regards to technical solutions, don't jump on bandwagons. It'll only end with a crash, most likely. As Bill Gates said in 1995 (I think) - "We ALWAYS overestimate the technical progress for the coming two years, but we always UNDERESTIMATE the progress for the coming FIVE years". Once again, think ahead. Don't do what everyone else is doing - in 2001 it was thousands of rip-offs of BB, Survivor etc. In 2008, rip-offs of Strictly come dancing or Farmer wants a wife, or why not game shows like Deal or No Deal. You can find hundreds of them, just go to MIPCOM this year and you'll see. No one can do it all by themselves. Well, Rambo can, but that's him. And you're NOT Rambo (probably). Some people are creative brains. Some are good salesmen. Others can work magic with numbers and economic figures. Ideally, you'd need a team consisting of all these types of persons - the creative minds coming up with the ideas, the salesperson getting sponsors in and selling the formats to productions companies and tv channels, and the economy guy keeping everything in check. If you're starting out, however, chances are this is not very possible. But you still have a GREAT idea for a tv show! Well - get someone else in as well. Just make sure that this person is not too alike you. What you need is different perspectives on things, someone to question your ideas and come up with new viewpoints, and vice versa. There will be a great many people that will have to like your idea before it's on air somewhere, and very few of them are likely to be carbon copies of you. ...tomorrow, number 9 on the list! This has got to be one of the best videos I've seen in a long while. The story goes that in 1969 a young man named Jerry snuck into John Lennons hotel room for a chat. This was recorded on a reel-to-reel tape recorder, and has now been released, together with some amazing pencil art by James Braithwaite. Watch it, for once it's 5 minutes of your life that are WELL spent on YouTube. TV formats - why buy them, when you can just steal them?? A memo from ABC leaked. 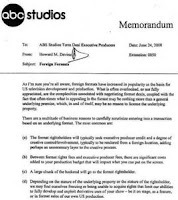 The memo, from the exec VP of ABC Studios, encourages everyone not to license formats from abroad. Instead, they should be brought to ABC.s creative studios to be "evaluated", to see if the "underlying premises" can be used without licensing the format itself. Phew once again, I say. As a format creator, this is what I fear the most. We have some pretty original and nice ideas going at the moment, but WHY ON EARTH would I pitch them to someone who is instructed by his or her boss to steal the "underlying premises"?? Sheesh... I mean, a year ago we were debating whether we should pitch one of our ideas to Endemol or not - seeing as Endemol has a reputation for nicking ideas - when we had a scheduled meeting with them. In the end, we did pitch it, but only because it was pretty funky and relied a lot on technical stuff. ABC, don't expect much sympathy from the format owners. Last I heard FRAPA were going to have some serious talks with you guys. Papers to write, pilots to plan, trips to book, people to meet, seminars and speeches to hold... and that's just the beginning. Here's to holidays! :) Now on with the workload!